Each July the sounds of summer include the sound of the JAG Marching Pride beginning their pursuit of performance excellence. The sounds of “The Best Band in the Land” can be heard from miles away, and this is when the anticipation of fall Friday nights under the stadium lights begins. 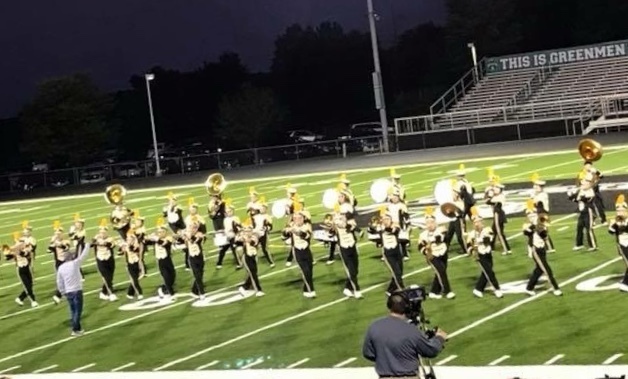 Under the direction of Band Director Theo Cebulla and Assistant Band Director Joel Logan, the JAG Marching Pride amazes spectators each and every Friday evening with their epic performances of hit songs such as “Sweet Caroline”, “Havana”, “Take On Me”, “All I do is Win” and “Radioactive”. While we have had perfect weather for Friday night football halftime performances, the band has performed through some tough and rainy conditions at the Solon Band Show and cool conditions at the Aurora Band show. The common thread among all performances is that, regardless of the weather, the JAG Marching Pride garners accolades after each and every performance. Homecoming this year is Friday, October 5 and will feature our own G-Men matching up against a talented Crestwood team. All alumni members are welcome to join the Marching Pride once again on the field for the homecoming halftime show. If you are a former member of the band and would like to march at halftime of the homecoming game on October 5th, please contact Mr. Cebulla at tcebulla@jagschools.org for more information. Fall evenings are special in our small town, and we invite you to come out to one of our remaining home games (October 5 & 26) and see our students shine! Go G-Men!